Jobs Description: PMC Jobs April 2019 can be viewed in our site. Visit our site to check PMC Jobs April 2019. 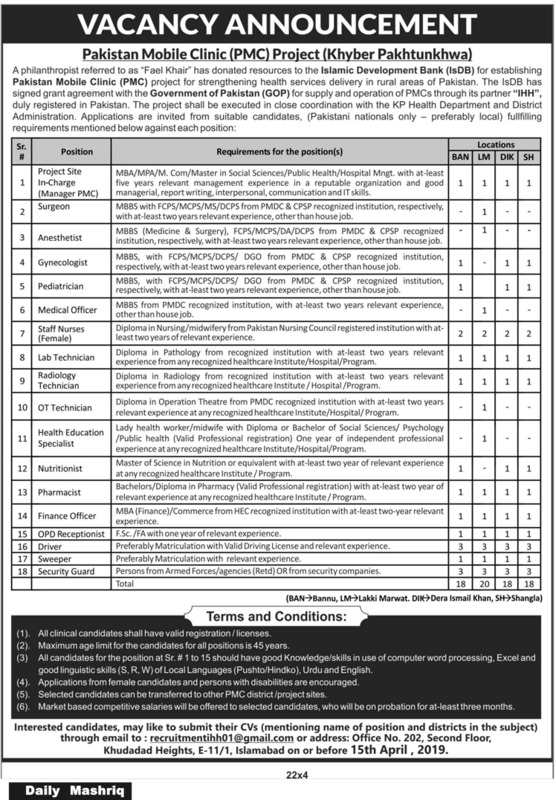 The Government of Pakistan recently announced an advertisement for Jobs of Manager PMC, Surgeon, Anesthetist, Gynecologist, Pediatrician, Medical Officer, Staff Nurse, Lab. Technician, Radiology Technician, OT Technician, Health Education Specialist, Nutritionist, Pharmacist, Finance Officer, OPD Receptionist, Driver, Sweeper, and Security Guard in the PMC (Pakistan Mobile Clinic) Project Khyber Pakhtunkhwa. Applications are invited from all over Pakistan. Pakistan Mobile Clinic (PMC) Project has required the applications for the following jobs.